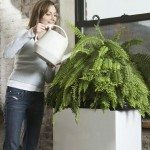 What temperatures can a boston fern handle? I would like to know the lowest temperature that a Boston fern can withstand. They usually cannot withstand anything below 45 degrees F.